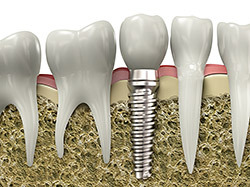 A dental implant is a synthetic tooth root in the shape of a post that is surgically placed into the jawbone. The “root” is usually made of titanium: the same material used in many replacement hips and knees, and a metal that is well-suited to pairing with human bone. A replacement tooth is then fixed to the post. The tooth can be either permanently attached or removable. Permanent teeth are more stable and feel more like natural teeth. The ideal candidate for detnal implants is a non-smoker who has good oral health, including a sufficient amount of bone in the jaw, and healthy gums with no sign of gum disease. 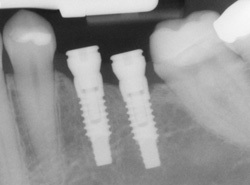 Dental implants are versatile. If you are only missing one tooth, one implant plus one replacement tooth will do the trick. If you are missing several teeth in a row, a few strategically placed implants can support a permanent bridge (a set of replacement teeth). Similarly, if you have lost all of your teeth, a full bridge or full denture can be permanently fixed in your mouth with a strategic number of implants. Sinus Lift Augmentation: Often the sinuses will enlarge following loss of the upper back teeth. This can preclude placement of dental implants in the upper back areas of the mouth, since the sinus is an air-filled space and dental implants need to be surrounded by solid bone. A sinus lift augmentation/graft is a surgical procedure that restores the sinus cavity to its original size, and replaces the bone that has been lost as a result of the enlarged sinus. Healing time for this new bone graft can vary from patient to patient before the dental implants can be placed. Dental Implant Site Development: When a tooth needs to be removed due to infection, it is not uncommon to have lost bone around the infected tooth. In these cases, various types of bone grafting can be done at the same time the tooth is removed to facilitate the placement of a dental implant at a later date. Computer-Enhanced Treatment Planning: We have special software on our computer that allows us to evaluate your dental CT scan in three dimensions for bone quality, bone quantity, and bone location, enabling the best possible placement of your dental implants. Dental Implant Maintenance: Once your dental implant restoration is completed, it is important to keep the area clean and infection-free. Dental implants can accumulate plaque and tartar just as teeth can. Whether you have just one tooth replaced by an implant or several, a professional cleaning schedule will be necessary to keep your implants healthy. The time interval for these professional cleanings will be determined by your individual needs.